U.S. District Judge James Redden doesn't hold back when Aaron Kunz of EarthFix and Outdoor Idaho asks him how to save endangered salmon. "I think we need to take those dams down," Redden said. 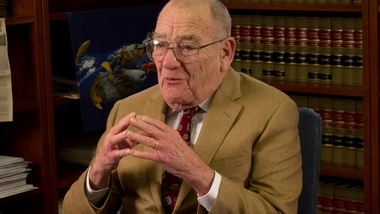 Redden stepped down in 2011 after ruling that the federal government's plan for protecting salmon and operating dams on the Columbia and Snake River was not adequate. He ordered a new plan be written by the end of 2013. Federal dam managers have alternatives to breaching the four dams on the Snake Rive in Washington, Redden told Kunz. They include spilling more water over all the dams to divert juvenile salmon away from powerhouses on the lower Snake and Columbia rivers. "The spills, which they do not like, that has been very helpful," Redden said. Salmon advocates say removing the Snake dams is cheaper in the long run and will have fewer impacts on the region than alternatives including spill. Dam supporters say it will end barge transportation to Lewiston and remove important carbon-free power sources. Here is the interview that will run this summer on Outdoor Idaho. Who is Judge James Redden? He was the federal judge who struck down three salmon and dam plans for the Columbia and Snake rivers, including the latest in August 2011. What dams? Redden told Idaho Public TV's Aaron Kunz that four federal dams on the lower Snake River in Washington need to be breached if the four stocks of endangered salmon that spawn in Idaho are going to be recovered. Kunz taped the interview for an Outdoor Idaho show for this summer. Did Redden mention alternatives? He said spilling water over the dams away from powerhouses helps the fish, but the federal agencies that run the dams and sell the power didn't like that. The Statesman explored scientific support for restoring salmon through increased spill in an A1 story Sunday. So why didn't Redden order the dams removed while he was the sitting judge? It's doubtful he had power to do that. Instead, he ordered more spill and for the federal agencies to rewrite their "biological opinion" by the end of 2013. Retired Judge Redden: Take Those Dams Down <-- Watch excerpted clips at original site.